The Fett pendant light from Tech Lighting is an instant classic. 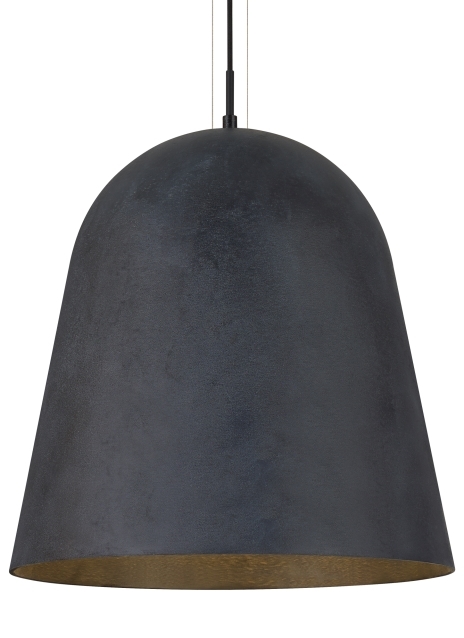 This significantly scaled pendant light cohesively blends its characteristic domed silhouette with its incredibly deep, weathered zinc finish. Its wonderfully imperfect signature texture is naturally created during a meticulous molten aluminum sand casting process that results in a noticeably thick shade that projects a truly monolithic presence. The scale and impact this large pendant light brings to a space makes it ideal for dining room lighting, living room lighting and home office lighting. Whether you select the efficient LED lamping or standard incandescent lamping, both options are fully dimmable to create the desired ambiance. Rated for (1)150 watt E26 medium base lamp (Lamp Not Included). LED version includes 120 volt 12 watt, 900 delivered lumen, 3000K, medium base LED G40 lamp. Fixture provided with twelve feet of field-cuttable cloth cord. Dimmable with most LED compatible ELV and TRIAC dimmers. Protected by a 1-year warranty, please visit www.techlighting.com for details.